It seems as if the past 20 years have generated a near blur of new developments and technology. Just 20 years ago, in 1988, we were all working without e-mail and waiting for Tim Berners-Lee to invent the World Wide Web in March 1989! The avalanche of new marketing outlets has buried some other options. For example, remember those pink, “While You Were Out” tablets for jotting down phone messages? Gone in favor of answering machines. Speaking of machines, the fax has turned into a friendly dinosaur for many companies that digitize everything. One powerful survivor through thick and thin is the yellow pages directory. Notice the term, “directory.” Fundamentally the yellow pages are just that – they direct people where to find products and services. But the yellow pages have evolved into a competitive advertising medium as well. There are a couple of reasons for this. First, it is perfect for geographically limited services like asphalt paving. Second, when people are flipping through the yellow pages, more than any other medium, they are in buying mode. They have generally already decided they need something; they just use the yellow pages to find out where to get it. That’s why display-advertising listings in yellow pages cost so much. On the other hand, when prospects are in the Asphalt section of the yellow pages directory, your ad must share their eyeballs and attention with your competitors! So how do shoppers differentiate you from your competition in a sea of asphalt companies? Does everybody just call AAAA Asphalt because they are listed first? Or do they call Bluto’s because his ad is the largest – or Red’s because it is the most colorful? Color is expensive in the yellow pages in spite of the fact that study after study proves that color ads do not pull better response than black only. Your best bet is to forego color and use the savings to expand the size of your ad. As you flip through the yellow pages, you may notice that when everything is screaming to be noticed, nothing stands out! Why are yellow pages ads so generally lame? The reason is that they are designed by your yellow pages sales person, not by a marketing person. You’ll notice that yellow pages sales people always offer free layout services included in the cost of the ad. Like so much that is “free,” this design service has no value for you and is probably costing you. The yellow pages staff wants everyone to be the same. It’s easier that way – for them. It may look easier to you, too, but at the high cost of blending in with everyone else. The most efficient way to differentiate yourself is to be different. Right off the bat, every ad is cramped and cluttered. Just having a clean, roomy ad makes a big difference and attracts readers faster than any color or border. Observe what others are doing and change it up. Notice in most yellow page advertising, the first thing you see is everybody displays his or her company name and logo as the most prominent thing in the ad. Of course you need to include your name and logo, but why not put the customer first? Start with a headline that attracts attention. What is the potential customer’s benefit in calling your company? Do you have an amazing and unusual guarantee? You should have – properly installed asphalt is a well-performing trouper, strong and durable. A rock-solid guarantee is very low risk for those in the asphalt business. It’s nice that your business is “family owned,” or in business for more than 25 years” or whatever. And these are certainly valuable statements that have their place in the yellow pages ad. In the asphalt business, longevity is an important asset to broadcast. But they are not the headline. “Mention this ad to receive free premium seal-coating for your new driveway” ... now that’s a benefit. And, it helps you track the success of your yellow pages ad and count the number of sales you are getting for your expenditure. Another good tip – don’t waste valuable space in your ad explaining you are in the asphalt business. You are already located in the book’s “Asphalt” section. 1. Buy the largest size ad you can afford. 2. Avoid paying for color. Black only is as effective as any other color. 3. Find the differentiating headline that offers benefit to the reader. 4. Leave as much blank space in the ad as you can stand. 5. List your services, logo, company name, credentials and contact information in smaller size text at the bottom of the ad. 6. Be sure to include your phone number and website address. Finally, this is so vital it is more than just a tip: ALLOW NO MISTAKES. If your ad has any error, you have no choice but to live with that error for the full, one-year term of the printed yellow pages book. 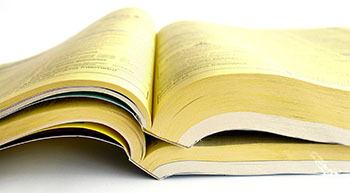 The yellow pages companies are not liable for your lost business due to an error. Proofread twice. Read the telephone number out loud. Have at least three others look at it. For an asphalt company, the yellow pages directory is that vital – if your phone number is wrong in the yellow pages, you might as well plan a long vacation.